French guard Isaia Cordinier works out in front of a myriad of NBA executives at the CAA Sports Pro Day in Los Angeles. -Very good athlete. Able to play above the rim in the half court or in transition. Can leap off of one or two feet. Solid straight-line burst with the ball. -Decent length relative to his height  6' 8 wingspan. -Can make a spot up three. Gets good rotation on the ball. Sound wrist action. Soft touch. -Shows potential as a slasher. Handle is loose but he's shown improvement in that area. Can play some pick and roll. Tries to play at different speeds/change direction. -Good vision. Very willing passer on the move. -Doesn't shy away from contact. Will try and dunk on weakside defenders. -Competes defensively. Not overly rangy but has good feet. -Tremendous teammate. Big time worker. Constantly high-fiving his teammates. Vocal despite language barrier. Plays with a high motor. -Thin upper and lower body  177 pounds. Fairly narrow frame. How much more room does he have to fill out? -Doesn't have elite size and length for a traditional two guard. -Catch and shoot jumper is very streaky. Shoots a set shot with a ton of arc. Doesn't have a lot of room for error with his mechanics. -Struggles to create space off the dribble. Much better off the catch at this stage. Not a very versatile shot maker overall. Lacks step backs and dribble moves to set up his jumper. Has to have his feet under him. -A bit hunched over with the ball. His ball handling limitations hurt his ability to use his athleticism in the half court. Shows potential but needs more polish. -Gets sped up vs pressure. Turnover prone. -Competes on defense but isn't overly rangy. Lacks the body to consistently contain. Can be a little bit jumpy, bites on fakes. Outlook Having played exclusively in the fairly weak French second division the past two seasons, it's perhaps no surprise that Cordinier had his struggles adjusting to the level of competition he found against a loaded US squad. He's not a ready-made prospect and will require a few more years of experience before being ready to make an impact in an NBA game. With that said, Cordinier's athleticism, shooting potential, passing ability and overall intangibles still make him an intriguing long-term prospect and an attractive draft and stash option in the late first or early second round. Down the road Cordinier could carve out a role similar to Tyler Johnson's of the Miami Heat as an attacking, athletic guard who competes, can pass and make a shot. This week in Portland did not help his stock, though, and he'll likely have to either do well in private workouts or the adidas EuroCamp to get himself back into the first round mix. Cordinier's measurements line up almost exactly with what he told us in our interview with him in France. He's actually grown marginally since then and while he possesses nice size and length for a shooting guard, he needs to continue to get stronger. Jonathan Givony is on an 11-day trip through seven countries to evaluate most of the top NBA draft prospects in Europe. On the eighth day of the trip, he was in northern France watching French shooting guard Isaia Cordinier. Cordinier's current club, Denain-Voltaire, has an interesting history in French basketball, as the hometown club of both Tony Parker's father and Herve Dubuisson, the first French player to ever be invited to try out for an NBA team (the New Jersey Nets in the 1980s). With an almost completely packed gym already an hour before the game (very rare in France in our experience), the home team enjoyed a terrific atmosphere that contributed nicely to what turned into a highly competitive game and may have been the highlight of the trip so far. Born Nov. 28, 1996, Isaia Cordinier is the same age as many of the NCAA freshmen who will enter this year's draft, although he could have entered the draft last year. Growing up in Antibes in southern France, with a stop-off in Martinique (a Caribbean island under French rule, where his family is originally from), Cordinier is the son of an international handball player and coach who competed in the Olympics and World Championship. His family's professional sporting background helped play a major role in helping to shape who he is today. Cordinier elected to leave the French Rivera for another Pro B (second division) club, Evreux, last season, and had a successful year that was derailed by a nagging knee injury (tendonitis) that lingered into the summer and continually requires maintenance. Moving to another Pro B club this season, Denain, which is on the border with Belgium, Cordinier has developed into one of the best players in the competition, averaging 19.4 points, 6.8 rebounds, 4.1 assists, 2.3 steals and 1 block per-40 minutes, on terrific efficiency (65% TS%, 53% 3P%). He had one of his best games of the season with a number of NBA scouts in attendance, posting nine points, six rebounds, nine assists in 34 minutes in a win. Cordinier is beloved by his head coach, Jean-Christophe Prat, who absolutely raves about his work ethic and intangibles, and is effusive in his belief that his young prodigy has a significant future ahead of himself at the highest levels of basketball. You don't often see a European head coach going out of his way to seek out NBA scouts and draft analysts in order to shower his young pupil with compliments, but that's exactly what happened in Denain. In a country that hasn't always done a great job of providing its young players with minutes, opportunity and development, it is refreshing to find a situation like this. In Pro A (had he signed there instead) I'm not sure if the coach would have put me on the court or not. We see in Pro B this year there are many young guys who can play 10-15 minutes in Pro A in a good level. I think the minds of French people are starting to change. I hope for years to come Pro A teams will give more chances to guys. In Pro B it is hard to play. There is not a lot of space. Defenses are tough. Sometimes ugly. It's helped me physically, to improve my body. With this coach if you work hard he will put you on the court. It's a big part of my decision last summer. I began well the season. I just need to keep it at a certain level and stay regular. I think I've improved a lot. Coach has helped me to become a better one on one player. Playing pick and roll, and hard defense. He's helped me a lot. I try to put it on the court when I play. He gives me confidence. He pushes you every day. Not a lot of coaches in France are doing what he's doing here. You can arrive one hour before the practice and he will be here to take your shot (rebound) or give you exercises to do. When you have a club with a lot of enthusiasm from the coach, the assistant coach, it helps you a lot to work, and it makes you want to work harder. While Cordinier is not an overwhelmingly gifted prospect physically (see next section) he is a very good athlete who moves fluidly, has a quick first step and is capable of playing above the rim with ease. He's developing into quite a versatile offensive player, showing strong perimeter shooting and passing skills relative to his young age. Cordinier is shooting an outstanding 26/49 (53%) from beyond the arc in 16 games this season, which is the key to the superb efficiency numbers he's posting. He does not have the most orthodox looking shot mechanically, with somewhat of a rigid release and footwork, but he shoots it the same every time and gets quite a bit of arc underneath his jumper. He shows potential as a shooter both with his feet set and off the dribble, and should be able to develop this part of his game in time as his strong shooting percentages this season suggest. Cordinier's strong first step and overall athleticism make him a dangerous threat in the open court, and he is extremely unselfish looking to find the open man. He was constantly probing the defense looking to make the extra pass and get his teammates involved, making a couple of very nice drive and dish plays in particular that were smooth, creative and under control. His feel for the game is very strong relative to his lack of experience, and he rarely forces the issue seemingly, almost to a fault at times. Cordinier's intangibles on the court may be the best thing he offers as a prospect. He plays with a rare spirit, looking completely immersed in the game, living and dying with his teammates on every possession, and showing a great attitude, whether he was in the game or cheering for his teammates off the bench. It's not a surprise to hear his coaches and teammates sing his praises and rave about his work ethic and character, as that is readily evident from watching him on the floor. All that translates nicely to the defensive end of the floor as well, where Cordinier has both solid tools, but also excellent competitiveness and intensity. He has very quick feet in man to man situations, and flies around constantly for blocks, steals and rebounds, diving on the floor for loose balls when needed. As his body continues to fill out, this could end up being a major strength of his, even against high-level competition. Cordinier does not have elite physical tools for a NBA shooting guard, standing (in his words) 6-4 ½ without shoes, with a 6'7 wingspan and a 183 pound frame that should be able to fill out in time. While this will not prevent him from playing in the NBA, he will need to continue to work on developing his frame and improving his skill-level, since he won't be able to rely on overwhelming his opponents with his natural tools. Cordinier is a solid straight-line driver who does a nice job of picking his spots and finding the open man, but his ball-handling skills are not overly refined at this stage. He's making major strides as a pick-and-roll and isolation threat, but is still a work in progress when it comes to operating at different speeds and creating separation from his defender in the half-court. His 2-point percentage is on the lower side at 49 percent, and he does not get to the free-throw line at an incredible rate. While his 3-point shooting percentage is superb this season, that hasn't always been the case throughout his career. It's clear he can continue to polish his mechanics and become more consistent. Cordinier missing time with knee tendonitis is something NBA teams will want to study more closely in their home facilities with their private medical staffs. This reportedly may be due to the fact that Cordinier still growing. Youth, inexperience, and the lower level of competition of France's second division (at least compared to the Euroleague and NBA) are all mitigating factors in Cordinier's evaluation as a draft prospect. He missed the U20 European Championship last summer with the knee injury, so scouts haven't had too many opportunities to evaluate him against other elite prospects at his position. Cordinier looked like a clear-cut first-round prospect in our evaluation in person and on film. He has a great framework to build off as a shooting guard and plenty of upside. From what we were told, it seems likely he will enter this year's draft to see how he measures up against other players at his position, and he has the option to withdraw in June if he doesn't like what he's hearing. The flexibility of his situation will certainly help his stock because an NBA team can opt to pick Cordinier and stash him in Europe for another year or two, which could be a big selling point for a franchise that has multiple draft picks and limited roster spots. Cordinier is hoping to be invited to the Nike Hoop Summit in Portland, Ore., this April, and his club seems willing to let him go despite being in the middle of a battle for a playoff spot. He could really help himself with a strong showing there, and there is no doubt he is good enough to contribute to the World Select Team's efforts in that setting. 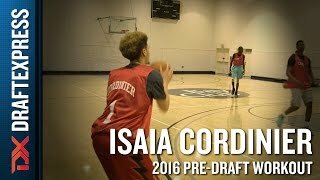 Breaking down the strengths and weaknesses of French guard Isaia Cordinier.